I took the oppurtunity on the first day that the Sterling Hill Mine was opened to go digging in the Passaic and Noble Pits, and dig through the mine run dump. The Passic/Noble pits are only open to collectors on the last Sunday of the month. It was still very cold and partially covered with snow, and this limited the finds somewhat. The mine run dump had some interesting Fluorite and Galena that was dumped from Lime Crest Quarry, and also had a bunch of dumped Agates from worldwide localities. Visit HarrimanHiker.com for photos I took of the mine that day. It's already a month past the Tucson show, and we have been busy this past month dealing with administrative and advertising and have not had much a chance to properlry update and add new content. We will now finally continue working on new material for the site. One of the more significant updates we are doing is the image gallery, so stay tuned. We have added a special page on meteorites. We have also added new photos of meteorites in the iron-nickel and olivine pages. Special thanks to Ruben Garcia of MrMeteorite.com for providing the content. Click here to visit the new meteorite page. I have been too busy getting back into things since Tucson and have not had a chance to make any new postings. Here is my first update from Tucson, where I went to most of the shows distributing flyers for the launch of our new website. My goal in Tucson was to get the community acquainted with the new site. I don't recommend trying this. Leave this to the professionals. At the Pueblo show, with Steven Bookbinder's massive Quartz Crystals from Brazil. Notice that giant Smoky in the back! Another masterpiece from Steven Bookbinder. This is definitley the largest Amethyst geode I have ever seen. Looking into the main TGMS show from upstairs. Another view from upstairs, facing the other way. 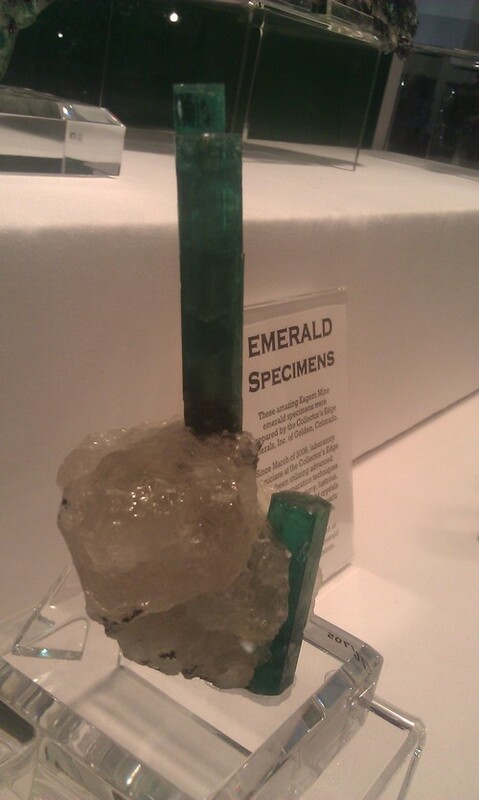 The iconic blue-cap Tourmaline that was the main theme mineral of the show. with a full-time guard stationed in front of it. Weight is 23.26 KG. Found in 2010. These outstanding Emeralds from the Kagen mine in Zambia were dominating! They rival the best Colombian emeralds in size and color. Specimens from this deposit are rarely seen, so this was quite an excitement in Tucson this year. 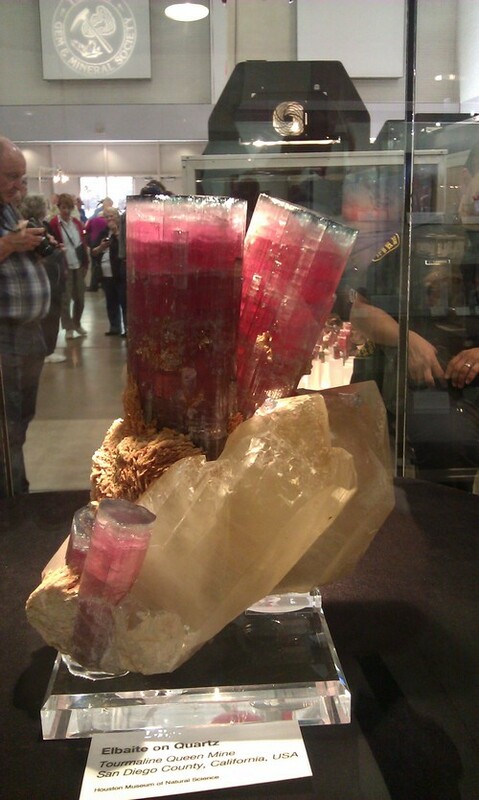 One of the many display cabinets displaying the minerals of California, which was this years theme of the show. A very aesthetic Aquamarine from Pakistan. The most talked-about Rhodochrosite at the show. Titled "The Emperor of China", this is an exceptionally large platy Rhodochrosite from Wuton in China. Exhibited at the booth of the Collectors Edge. Nice display of Calcite and other minerals at the show. A huge faceted Emerald from North Carolina. 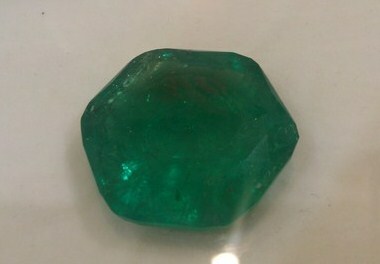 According to owner Terry Ledford, this is the largest faceted Emerald from the United States. Terry, if you get to read it, please post the carat size below! This struck me as really interesting - a native Copper polished bookend! 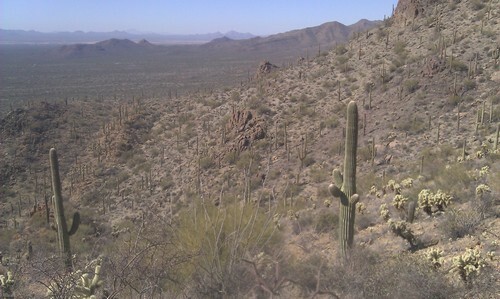 Hiking in the Sonoran Desert on Friday in the Tucson Mountains Reserve near Gates Pass. Trip up Mount Lemmon after the Show. This is at Windy Point on the Catalina Highway.